The Islamic State group says it was behind a car and knife rampage at a US college that left 11 people injured. 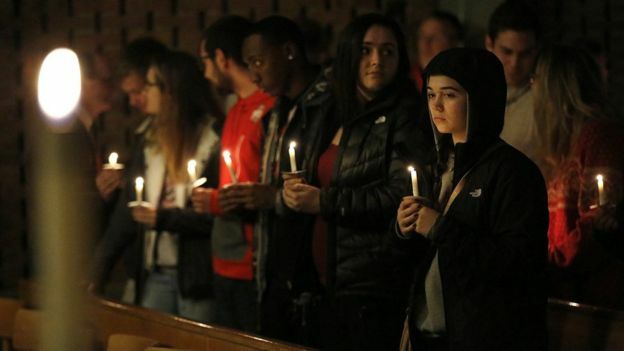 Monday’s attack at Ohio State University was carried out by one of its students, Somali-born Abdul Razak Ali Artan, the authorities said. The IS-affiliated Amaq news agency called the 18-year-old business undergraduate a “soldier”. Artan drove his car at a group of people, then attacked them with a knife before being shot dead. The IS claim does not prove much in terms of the attack in Ohio. The group often refers to individuals who carry out attacks as its “soldiers”, but the crucial question is firstly whether the individual had any form of direct contact with IS. Face-to-face contact may be unlikely but online communication is possible. If there was no direct contact, it could still be the case that an individual was inspired rather than directed by the group. In this case, an individual may leave his or her own pledge of allegiance in written form or online or in a video. But until such evidence emerges, it remains hard to know if this is just an opportunistic claim by the group rather than one based on real substance. A BfV spokesman did not confirm a report in Die Welt newspaper that the man was suspected of planning a bomb attack on the BfV’s Cologne office, Reuters news agency said. “There is no evidence to date that there is a concrete danger,” he added. The BfV said the suspect, who now has German citizenship, had previously “behaved inconspicuously”. “The man is accused of making Islamist statements on the Internet using a false name and of revealing internal agency material in Internet chatrooms,” the spokesman added. 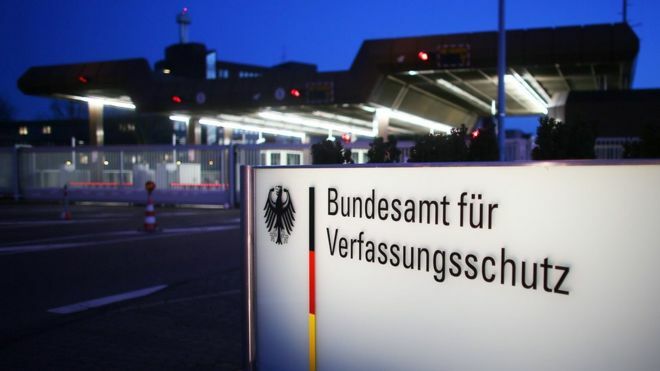 BfV did not confirm which part of the intelligence agency the accused worked in, though German news magazine Der Spiegel said the man was recently hired to observe the Islamist situation in Germany. It also reported that the man’s family had no knowledge of his conversion, which the publication said took place in 2014. The BfV – the Federal Office for the Protection of the Constitution – is Germany’s domestic intelligence agency. Its counterpart, the Federal Intelligence Service (BND), deals with foreign intelligence. There are an estimated 40,000 Islamists in Germany, including 9,200 ultra-conservative Islamists known as Salafists, the head of the BfV told Reuters news agency earlier in November. Germany’s foreign intelligence chief has warned that Russia could seek to disrupt next year’s German elections with cyber attacks. Bruno Kahl said his agency was aware of cyber attacks with no other purpose than “causing political uncertainty”. 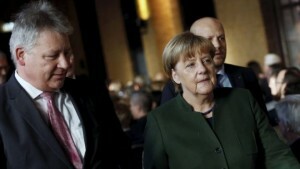 “Europe is in the focus of this attempted disruption, and Germany in particular,” he told Sueddeutsche Zeitung. Russia or groups linked to Russia have been regularly accused of such attacks. Campaigning has yet to start for federal elections in autumn 2017 but Angela Merkel announced last week she would be seeking a fourth term as chancellor. She told reporters that hacking attacks were now becoming commonplace and people should not allow themselves to be annoyed by them. She was speaking after a cyber attack on Sunday left 900,000 Deutsche Telekom customers with their broadband service cut off. The German government has not yet blamed any group for the hack but says “it’s hard to tell the difference between criminal activities from a particular state and state activities”. “Such cyber attacks, or hybrid conflicts as they are known in Russian doctrine, are now part of daily life and we must learn to cope with them,” Mrs Merkel said. Police officers have shot and injured a 31-year-old man in a Hull street. 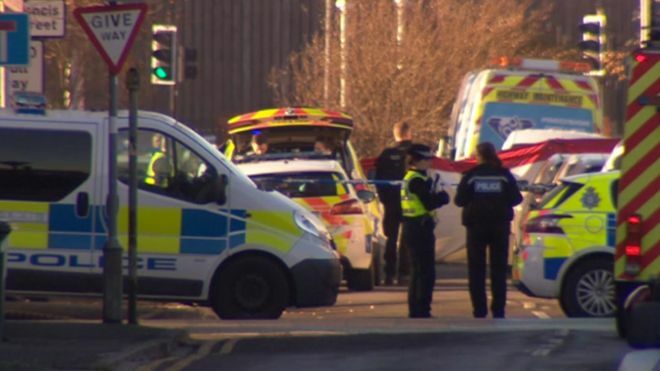 Humberside Police said armed officers had been sent to the Holderness Road area at around 09:20 GMT following reports of a man with an axe. The man was shot on Francis Street about 20 minutes later. The man is receiving medical treatment. The force said the incident had been referred to the Independent Police Complaints Commission (IPCC) and an investigation is underway. Anti-terrorism police patrol units are to be introduced across London boroughs. The Met said uniformed and undercover officers will be on the streets to spot those carrying out “hostile reconnaissance” and other crimes. The patrols will begin in Lambeth and Wandsworth “to disrupt potential terrorist activity and crime” on Monday. The force stressed the move was “not in response to a specific threat”. Operation Servator is a tactic of policing already used by other forces including City of London and British Transport Police. 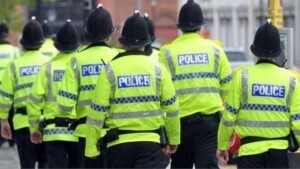 Patrols are due to be expanded across the capital in the coming months. A spokesman said the operation was “based on extensive research into the psychology of criminals and what undermines their activities”. Specialist teams including the dogs and boat units and the territorial support unit will be on hand to support the patrols. The move also aims to encourage local people to keep their eyes open for suspicious behaviour. City of London Police introduced Servator tactics in February 2014 using undercover teams, CCTV and number plate recognition technology to add to the 1990s “ring of steel” in place around the Square Mile.